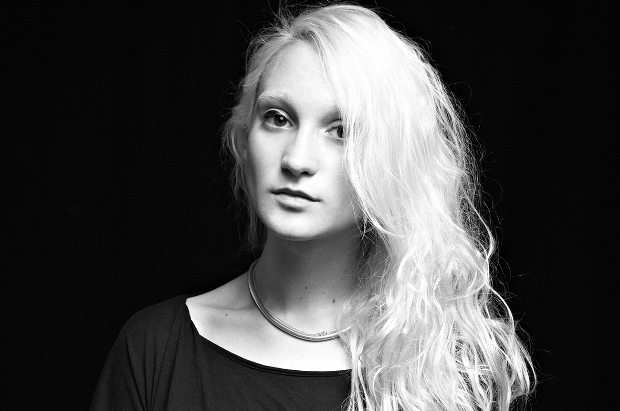 Phoebe English is a young womenswear designer who has gained recognition for her contemporary yet organic aesthetic, which grew in part out of a keen interest in experimental construction techniques and surface textiles. She graduated from Central Saint Martins with an MA in Fashion in 2011, and the same year formed a partnership with one of her earliest customers, Rose Easton, who now acts as Creative Director. Easton English incorporates the Phoebe English brand, now stocked in DSM, Bluebird and internationally. Soon after graduating you joined forces with Rose Easton to form English Easton. This must have been an important business decision for a new graduate. What sparked it and what has it meant for you? I made a dress for Rose, for a birthday. I think she could see I was a bit swamped. We made friends and decided to do a small collection for Vauxhall Fashion Scout, to see how it went. After that we received an order from Dover Street Market and the very next day we registered our company. You are involved with the Centre for Fashion Enterprise in Hackney and gained a place on their New Fashion Pioneer Programme, then progressed on to the New Fashion Venture Programme in June 2013, which helps designers identify areas of growth and provides financial subsidy. What has the latter meant for the development of your brand? What do you think the centre offers young designers? The Centre for Fashion Enterprise (CFE) has been invaluable in the development and growth of my business. I cannot express enough how much the support, advice and mentoring has helped us; it takes you from being a singular designer to a fully-fledged business. The CFE offers information to designers that it’s just not possible to find elsewhere, from how to source and build relationships with your manufacturers to cash flows. Every single aspect of your business is nurtured. We are currently working with an e-commerce developer mentor. Do you find the changing landscape of East London inspires or informs your work? East London and Hackney is such an important aspect of how I work, it’s where I have had all of my studios and it is also where I have lived for the last five years. It is forever changing and filled with an abundance of incredible people. Nothing inspires me more than simply walking between my home and the studio – there is always an amazing variety of characters to see along the way. Your AW14 collection saw you reinterpret modern tailoring, with elegant yet organic jackets and dresses. What inspired this collection? CORE is a season-less collection that you produce, turning the transience of fashion on its head. How did this project come about about? It is a small collection of pieces, which are made in our typical materials of rubber and muslin, and also incorporates some simple matte latex pieces. They are all very simple but aim to fit into outfits you already love to wear. It really came about because of friends and clients enjoying particular pieces we had done in the past; and also from pieces that Rose and I enjoyed wearing more on a daily basis than for special occasions. CORE seems to explore the life span of clothes and sustainability of fashion. Is this something that interests you? Yes, I am very interested in timeless beauty, it is very important for me that the clothes can work both in London and across the world. The aesthetic must be transferable, not just London-centric. Any new collaborative projects in the pipeline? I will be working with my dear friend Helen Bullock for SS15. We have worked and studied together but this will be the first time we have collaborated on a project. Helen has such an opposite structure to how she works, which is so exciting for me. I want the work we do together to be like a breath of new air in the collection. What can we expect for Phoebe English SS15? Films, surprise projects, e-commerce and a brand spanking new collection!